No swashbuckling hero would be complete without a secret hideout to keep him safe from his enemies, and no ruthless villain would go through life without an imposing fortress from which to work his twisted will. Now these thrilling locales are yours to explore! 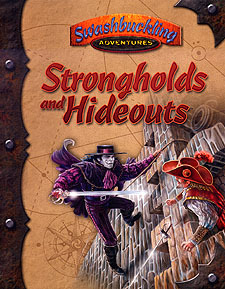 Strongholds and Hideouts contains a plethora of exciting Thean locations suitable as settings, dungeon crawls, or adventure seats in any campaign. From the Forbidden Cove to the dungeons of Villanova, Strongholds and Hideouts has the real estate you're looking for! Complete details on ten Thean strongholds and hidden locales - from the headquarters of the Rye Grin to the terrifying Puzzle Maze of the Coruscites. Each is designed to be easily compatible with any fantasy campaign! Beautiful maps, extensive statistics, and adventure hooks designed to place your party in the middle of the action! To use this companion, a Game Master also needs a copy of Swashbuckling Adventures, and the Dungeons & Dragons Player's Handbook, Third Edition and Dungeon Master's Guide. A player needs only Swashbuckling Adventures and the Player's Handbook.